To say that life with a newborn is exhausting would be an understatement. Body aches and pains, skin as dry as the Sahara desert, fatigue from sleepless nights.... so the voucher I'd been gifted* to experience an Oriental Hammam Ritual at Fleur de Lys spa in Sydney's Woollahra was definitely something I was looking forward to. On the day of my treatment I had a minor freak out... how can I stay away from the baby for that long, what if he gets hungry? what if he needs a nappy change? what if...? So the best solution was to take the husband and Luca, then 4 weeks old, with me! The idea was that while I was getting my treatment the husband would keep him entertained, and at most I'd be away from him for only an hour. 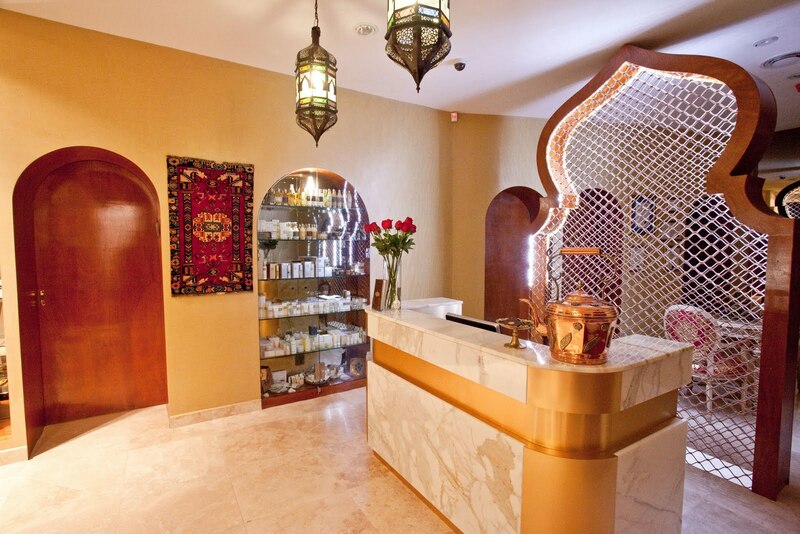 "Fleur de Lys Medispa is a magnificent tribute to ancient Moroccan traditions offering a warm entrance to an oasis with calm settings, the scent of rare oils, soft light, candles and Moroccan adornments that will stimulate your senses and soothe and rejuvenate inner health and wellbeing." Upon entering the magnificent reception area of Fleur de Lys I was greeted by the lovely Linda, the spa's Director, who offered me rosewater to drink while I filled out a health questionnaire. At first I was sent into the sauna for 20 minutes to relax while the Hammam was prepared for me. Sitting in temperatures reaching up to 70C (158F) was enough to make me sweat and and melt off some of the tension in my body. "The Hammam experience offers an escape to an oasis of steam, beautifully tiled walls, the scents of oriental oils and perfumes and the soothing comfort and echoes of running water. Our treatments are performed while you are relaxing on a heated marble table which helps stimulate blood circulation and opens the skin pores." 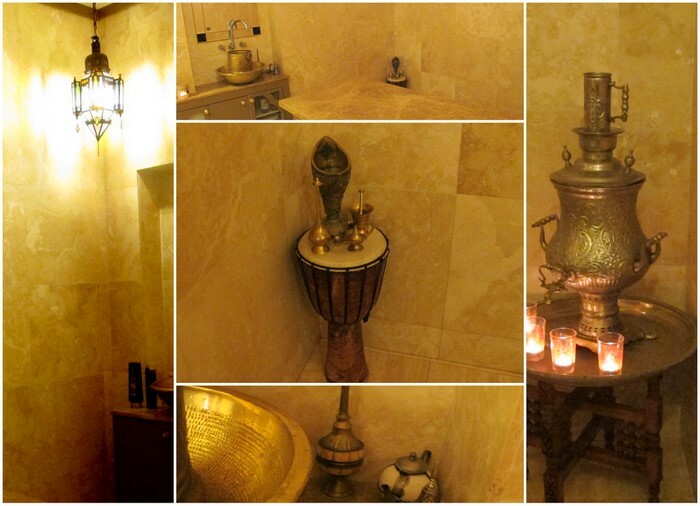 "Embrace the ancient traditions of the Orient with our Hammam ritual. Your body is covered with traditional black soap followed by a thorough scrubbing on the heated Hammam table and combined with soothing Rhassoul clay from the Moroccan Atlas Mountains mixed with rose water to nourish your skin.Your treatment is finished off with a soothing application of the traditional Argan oil mixed with essential oils to nourish your skin and to complete your oriental experience. 50mins/$195AUD"
It was just bliss laying back on the warm marble table and being scrubbed of months of dead skin (during the last trimester of my pregnancy and after the birth of Luca I had done absolutely no body moisturisation so there was a lot of gunk to scrub off!). The application of pure Argan oil completed the body treatment. I'm pretty sure I dosed off a few times, it was that relaxing! The products that were used on me. My hair was then washed and conditioned with Schwarzkopf Marrakesh Oil & Coconut Shampoo and Conditioner (review during Part 2). After the treatment - clean, scrubbed and glowing. And what was little Luca doing while I was getting the Oriental Hammam Ritual? Sleeping in his pram the entire time! If you're ever in Sydney and are after a relaxing spa experience the Oriental Hammam Ritual is highly recommended. In fact check out their website, as they have a range of other treatments and also monthly specials that you can take advantage of. "Fleur de Lys Medispa is located at 2A Queen Street, Woollahra close to the bustling heart of Oxford Street but far enough away to provide a tranquil oasis of calm. Phone 02 9361 4441." *Fleur De Lys voucher courtesy of Schwartzkopf and Mango Communications. I'm not affiliated with the brand or the company and no payment was received for this post as per my disclosure statement. This sounds amazing and a well deserved treat for you I'm sure! The Hammam room looks so lush! Love the Morrocan style. Truly a great place to unwind. I've been to this spa for a mani, oh goodness it is heavenly in there. Hoping to squeeze a trip in when I head to Sydney for IMATS! I have been thinking about buying the conditioner from that Schwartzkopf line...looks so luxe for such a great price! oh i love to go to hammam - it's so amazingly relaxing ... your baby is so adorable!